Ex-BMW Designer, Chris Bangle has come up with a striking design for an EV that is designed more as a living space for those traffic jams that you are likely to be stuck in. Chris Bangle conceptualized the all-electric REDS (Revolutionary Electric Dream Space) car for you high-income Chinese professionals who want to make a lifestyle statement with their vehicle. He was a asked to design the car by China High-Tech Group Corporation (CHTC). The car is meant to be a fourth living space after their homes, offices and social haunts. REDS is meant to be more of a part-time car and a full-time living space. The details about the technical aspects are sketchy. When compared to the Smart For Two the car is 11 inches longer, 10 inches narrower, and eight inches taller. It has a much shorter wheelbase at 56.7 inches. Unlike the Smart For Two which is meant to accommodate two adults, the REDS is meant to accommodate four adults when moving and five when parked. The front seats have been skewed with regard to the loveseat in the rear. When the vehicle is parked, the rear passengers can extend their legs between the front seats and the rear bench has room enough for three people when the steering wheel is flipped up and the driver’s seat is moved 180 degrees. The 17-inch infotainment screen is fully retractable and there is a table that can descend from the ceiling of the cabin. The car can help you relax on the go as anyone sitting as a passenger in the front seat can enjoy a remote-controlled foot massage. The rear tailgate doubles as a bench. The windshield has a forward slant to allow for the flipped-up steering wheel. The driver can see elevated items like stoplight thanks to the bulbous window at the leading edge of the solar-panel-covered roof. The rear glass too is tilted to allow for more headroom and mimics the front. The REDS vehicle which is a fully functional rear-wheel drive car made from aluminum that can reach a speed of 75 miles per hour. 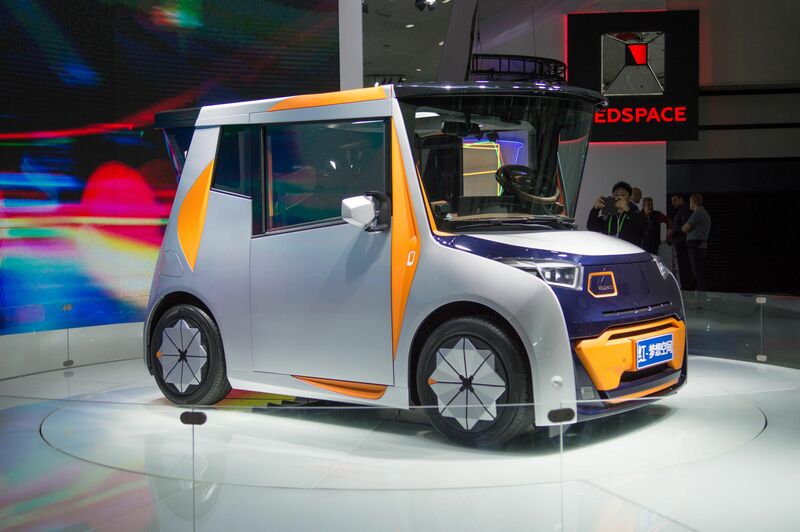 The plan is to conduct comprehensive tests of the prototype with production being slated to start in another two years/ The car will be made by Redspace, which is a new company that CHTC has established for car production.